Foshan Hentech Technology Development Co., Ltd. 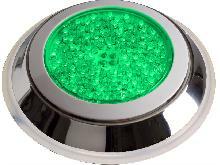 This is a high technology electronic controlled light based on LED’s in three colors: red, green and blue. These three base colors together can produce many other colors to create the perfect atmosphere in the pool. 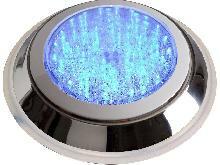 Any of the16preprogrammed effects can be selected with the on/off switch of your pool lights. The LED’s can also be warm white only or natural white only. The LED’s are driven by constant current. The technology of True PWM is adopted on the lights. High temperature protection makes the LED’s be protected while the internal temperature reaches a high level. All these technologies guarantee long working life of the LED lamps. fully with resin, the lights are completely waterproof, and they must be used / operated while fully submerged underwater only. All lamps should be installed on the same transformer and switch. • The lamp is supplied with cable of 2m, 4m, 6m, 10m, 16m or 20m according to the need of the user, making it possible to install multiple lamps connected to a single junction box.Dissemble the bracket from the back of the lamp. Place the bracket over the desired location, mark the holes, drill the holes, insert the roll plugs, and fasten the bracket on the pool wall using the stainless steel screws provided. Wind the cable behind the lamp, and then fasten the lamp on the bracket. See drawings on last page for more detail.